The most enchanting characteristics of Argentina’s capital may not be entirely genetic in terms of having grown from an indigenous seed – as accounts perhaps for other metropolises. Buenos Aires’s obvious charm is much rather the result of the Old World wanting to settle in the new one without abandoning their familiar ways and traditions. Immigrants arriving to the country during the nineteenth century created a fascinating mix of distinct ‘European’ style neighbourhoods by lending their foreign identities to acquired territory: Madrid is now in Avenida de Mayo, Paris in Recoleta and Alvear Avenue or Naples in La Boca. Downtown Buenos Aires exudes the atmosphere of grand colonial times to this date. Spanish, Italian and French cultures made sure to also leave their legacy in sectors such as education, art, architecture and gastronomy. Native and European ingredients were blended into a random cocktail of cultures and races that goes down well, the dark political ages of a country suppressed by a military junta are long gone. Today a new wave of expatriates seeking a fresh challenge in life enriches the ever increasing diversity in urban population. Buenos Aires has been moulded by many minds and hands – to become one of the most alluring and liveable cities on the globe. Could three million Porteňos err? 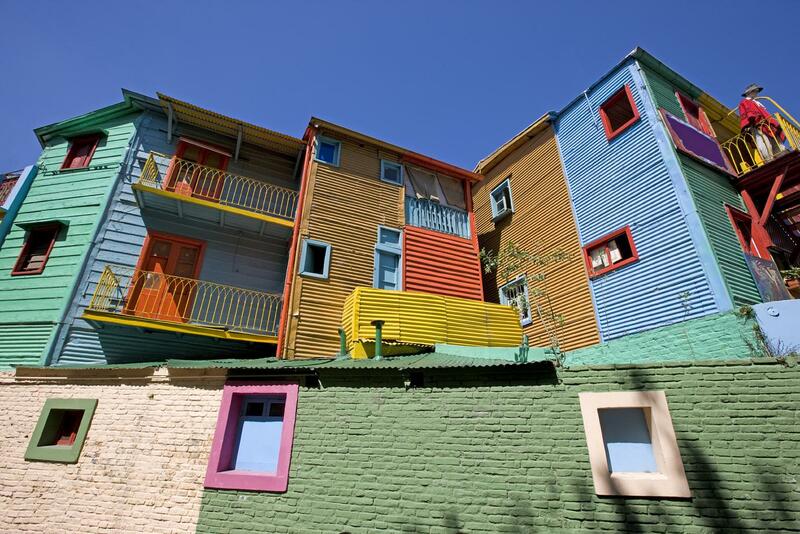 The conventillos of La Boca – one of the districts founded first. La Boca (the mouth) in the harbour area definitely has to be on the menu of any interested visitor. Images of conventillos – picturesque houses painted in brilliant colours typical of this district – are travelling the world. The building material was scraped together by poor immigrants and mostly consists of remnants from the shipyards nearby, like wooden planks, metal and corrugated iron sheets. There are bars, canteens and inns, many serving Italian food abundantly plus a couple of good museums lining the two dominant streets, one of which is Caminito. While in La Boca it is advisable to be on guard, at night especially. 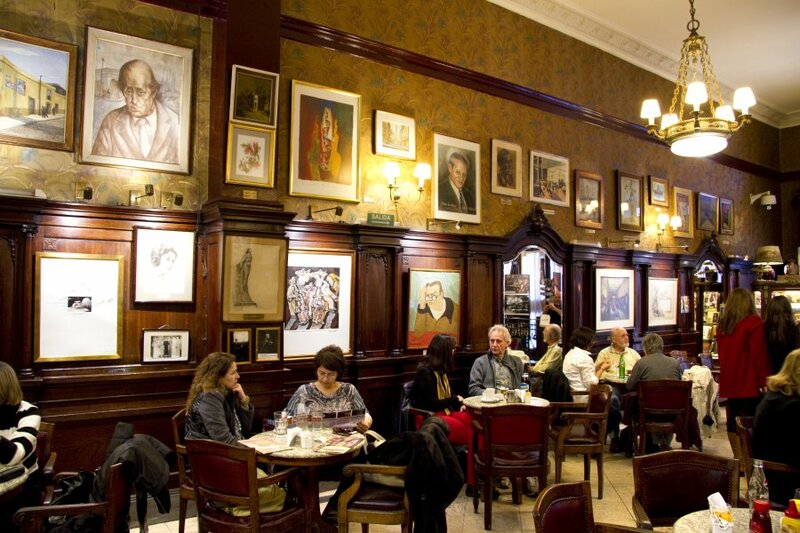 Café Tortoni – a legend. Puerto Madero – the city’s most contemporary – and expensive – quarter spreads out in the old docks, which have been restored and converted into a busy lifestyle area. Delicious food is to be had in hundreds of tantalising outlets – just in case the stomach grumbles during a stroll along the fashionable banks of the Rio de la Plata. Over the past years, Tango has experienced a breathtaking revival sweeping the entire world off its twitchy feet. Tango schools – where dance enthusiasts practice along melancholy bandoneon music to the point of exhaustion – are still sprouting like mushrooms. There are many variations of the traditional Tango, one must know: Tango argentino; canyengue; Uruguayan; liso; salon; orillero; camacupense; milonguero; nuevo; show; ballroom and: Finnish. Every August the city hosts the Buenos Aires Tango Festival, a nine-day carnival of events, including shows, exhibitions, free classes, milongas and concerts at a variety of venues. It is followed by the prestigious World Tango Championships later in the month. Buenos Aires also offers an abundance of MICE facilities suitable for events of all shapes and sizes: Three exhibition centres with a total surface of more than 150.000 s.qm and state-of-the-art technical services and 4- and 5-star hotels with 500+ halls and individual capacities for up to 2,400 persons. Unconventional spaces making unusual venues – like former factories, soccer stadiums, restaurants, theatres, cultural centres and even some hangars inside the Aeroparque Metropolitano regional airport, complement classical alternatives. Not to be omitted: the large number of sensational cafés and bars catering for the leisure side to business, more than 70 in total. Copyright for all photos: ©INPROTUR.